Many interesting cases have presented themselves over the years, and the case I saw just before Christmas was no exception. The interesting case isn’t always the one with the most extreme pathology. We get lots of those. Sometimes what makes a case interesting is the opposite: i.e. the patient who presents with odd symptoms in the absence of severe pathology. These are the cases in which the patient has seen countless specialists and has been dismissed by all of them. The morning of December 19 I walked into the exam room. Sitting in the exam chair was a young man of 18 years. Opposite him were sitting his parents, who were obviously distraught and frustrated. 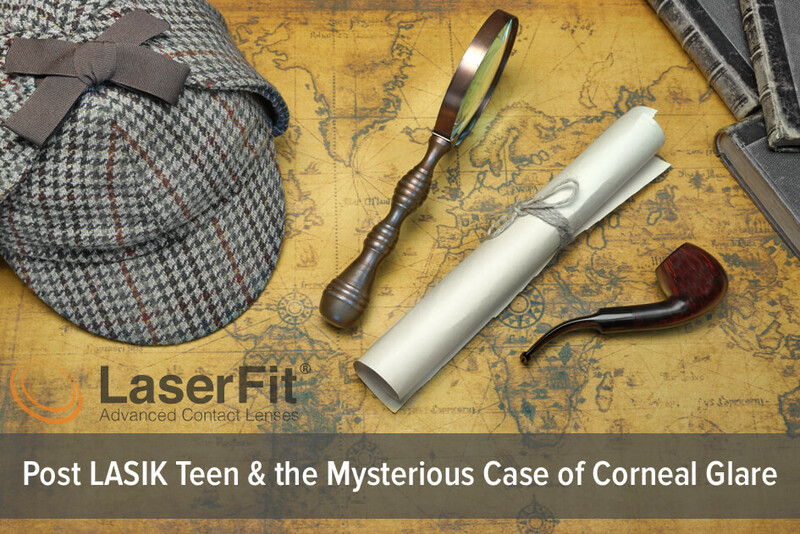 The young man had undergone a bilateral LASIK procedure 6 months prior, and then his life just stopped. He should have been in college, but lost the motivation after the surgery. His symptoms actually started before LASIK. But instead of correcting the problem, the LASIK made things worse. The symptoms resembled those of other patients who had complaints following their surgeries, i.e. low light glare, dry eyes, night vision disturbance, etc. After seeing many doctors, including neurologists, and having many tests including an MRI, the LASIK surgeon recommended that he look into scleral lenses, and referred him to a research institution involved in scleral lens research. Instead, the parents brought him to see me. I could see that this case would test my powers of deduction in a manner befitting Sherlock Holmes. The patient had a very slight amount of myopia, and was able to be corrected to 20/20 vision in each eye with spectacles. He did have dry eyes and had used Restasis and now Xiidra. Next we measured his aberrations, and they were abnormal, but only slightly. With his large pupils (7.0 mm in the dark), his higher order aberrations measured 1.129 microns in the right eye, and 0.839 in the left. However, with 6.0 mm pupils, they were almost normal in one eye and normal in the other. So we went ahead and designed a set of Laserfit lenses using standard optics. While he noticed a difference, some of the symptoms that were bothering him were still present. But what were they and what was causing them? I had to delve a little deeper. In the room with the lights off except for the projection chart, I asked him to describe the problem. He said he saw vertical light streaks emanating off the lit screen. I asked him when this first started, and he replied about a year before LASIK. Then he confided something else. He said that he had worn soft contact lenses, and that they were difficult to remove. In order to facilitate removal, he would use a hair dryer to dry the lenses out and that would make them easier to remove. He said it was not long after that when he noticed that the aberration suddenly appeared. He thought he had damaged his eyes. Then I tried an experiment. I had him first raise his chin and then lower his chin and to tell me if this had any effect on the streaks of light. He said that they had disappeared with his chin down. Lowering the chin had the effect of having him move his eyes in slight up-gaze, and in this position I noticed that his eyelids were covering the upper half of his corneas. Therefore, whatever was going on was to be found on the superior part of his corneas and that’s where I looked with the slit lamp. What I saw was a very extended superior limbal transition zone. It almost looked like pannus, but the blood vessels were looped. Was this a normal variant? I don’t know. I do know that I had not seen anything quite like it before. As the light passed through the cornea this area would act like a diffuser. But how to fix it? I noticed that the lenses did drop a little. So with the next set I raised the optical zone to make certain that the superior part of the cornea was covered by the optics. In addition I used wavefront-guided optics to reduce the aberrations further. Like magic, the problem was solved. For the first time in many months, this young man was free of aberrations. In fact, he was now able to see 20/10 with each eye with his new Laserfit lenses. With this mystery solved, he could quit worrying and get his life back on track. Now, Dr. Watson, it’s on to the next case.